Fragment of Bird-Catcher’s Headdress, 2014. 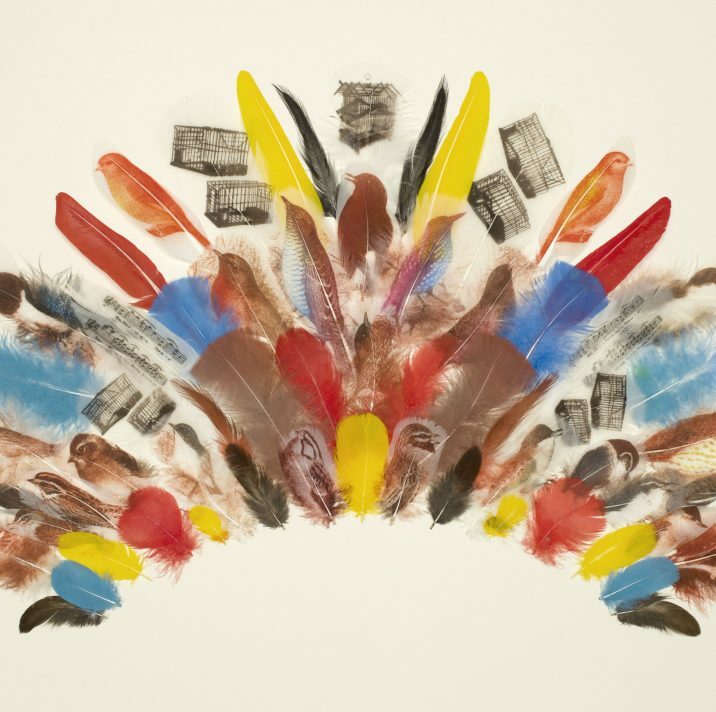 In the latest instalment of our 'Artist Spotlight' series ACS artist Rebecca Jewell discusses the use of feathers in her work and the inspiration she draws from communities in the Pacific Islands. I have worked in watercolour and printmaking for most of my career as an artist, but for the last five years I have been working with ‘printed feathers’. Birds and feathers have always been the subject of my work. My PhD at the Royal College of Art was about understanding the significance of bird-human relationships and understanding feather artefacts through drawing. I have drawn and painted feathers, printed with them, and printed on them. Feathers are extraordinary and it is a challenge to improve on their significance and beauty. Since living in Papua New Guinea for a year in 1982, the Gamugai people I knew there, the cloud-capped mountains, the birds of paradise, and the tropical forests have continued to be my inspiration. I have been drawn back to the Pacific on several visits (including the Solomon Islands in 2009) and I have worked with the British Museum Oceania collections for over ten years. The feather capes, headdresses, and feather gods from Hawaii never cease to amaze me. The youngest daughter of zoologist and archaeologist parents, I grew up visiting museums and going on field trips. I have always collected and catalogued specimens and artefacts. I love the drawings made by artists on the early voyages of exploration, (for example Sydney Parkinson on the Cook voyage) and the magical botanical paintings of Maria Sibylla Merian who published her first book of illustrations in 1675. Cabinets of Curiosities intrigue me and I admire the work of contemporary American artist Mark Dion. My recent work addresses issues of hunting and trapping of birds and the decline and extinction of avian species. In 2016 I made ‘Oceanic Egg’ for an exhibition on the ‘Migration of Artefacts.’ I covered a large fibreglass egg (measuring 70cms high) with coloured and printed feathers. 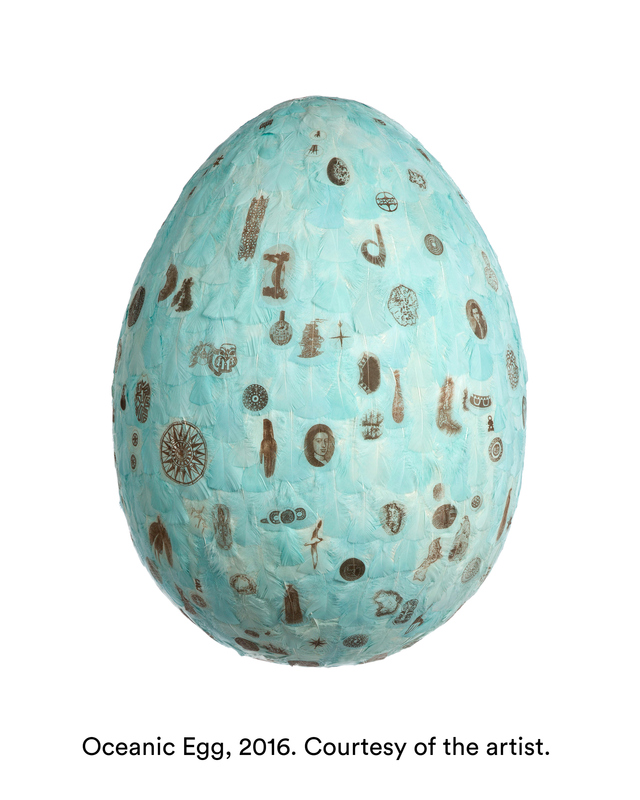 I wanted to create an image of a giant ‘duck-egg’ which represented the ocean, collaged with floating objects, which represented their movement around the world. Using oil-based etching inks I mixed a pale duck-egg blue. I then researched all the images required – portraits of explorers, navigation tools, island maps, designs and artefacts. I sorted, steamed and cut white turkey feathers so that they were smooth and clean, and I inked-up a metal plate with the blue ink. The feather was laid onto the plate and run through my press – so that the feather picked up the ink. The feathers were then pressed and dried. Some were kept plain blue, and others were printed with images using the paper litho method. This involves inking-up a photocopy of the image and the feather placed on top and run through the press. The right feather must be chosen to fit the image perfectly – remembering that the image will be printed in reverse. It is tricky to get the right pressure, the correct amount of ink on the ‘paper plate’ and the image in the right position. Once all the feathers were printed, pressed and dried, I began to cover the egg, starting from the bottom and working upwards so that the feathers overlapped each other like the feathers on a bird. 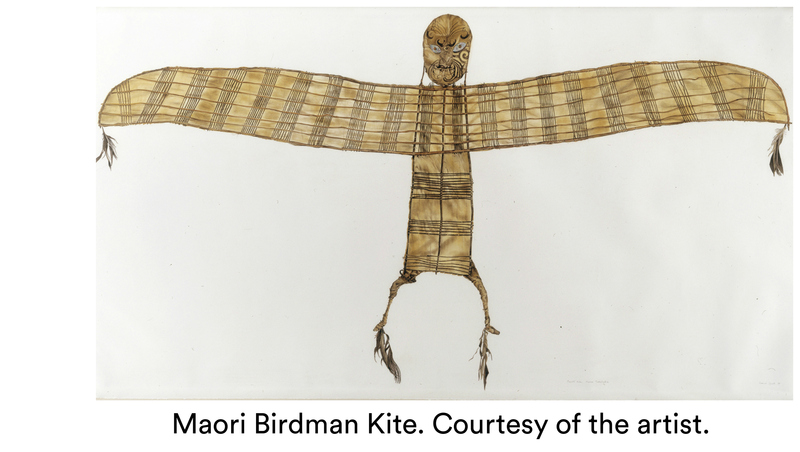 One of the first significant works I made, and I still feel very proud of it, was a pastel drawing of a Maori birdman kite. During my first year at the Royal College of Art (1998) I came across an amazing kite in the British Museum stores, dating from 1843. Birds have long been seen in the Pacific as representing a link between the tangible world of the living and the intangible realm of the spirit. The kite is made from cotton, stretched over a wooden frame of thin sticks. The painted face has mother of pearl eyes and the talons of the bird are made from Hawk feathers. It would have been flown by Maori priests, for divination and to scare the enemy in battle. I spent three months visiting the Museum stores, slowly creating the life-size drawing – it measures over two metres in width. One aim of my PhD was to create a ‘paper museum’ to enable artefacts to be seen which otherwise are in storage – and one of the reasons this piece has been so successful is because it has fulfilled that remit. The actual kite in the British Museum is very fragile and unable to go on exhibition – but my drawing has stood in its place many times: at the Sainsbury Centre for Visual Arts in Norwich, at New Zealand House, in London, at the North Entrance of the British Museum – and it has been on exhibition at the Royal College of Art and the Rebecca Hossack Gallery. It now hangs over my stairway at home, presiding over my family and our visitors. Rebecca is currently creating artwork inspired by ‘Banks’ Florilegium’ for The Queen’s House (Royal Museums Greenwich), which will be on display later this year in the Queen’s Parlour.